From left: Sofia Stolberg, co-founder and chief executive of Piloto 151 and Enrique Ortiz de Montellano, president of Claro, discuss details of the partnership. Telecommunications provider Claro and Piloto 151 announced Thursday a partnership to provide Puerto Rico’s technological start-up community the infrastructure, mentoring and training needed for their growth, representatives for both companies confirmed. The agreement aims to support emerging companies that create jobs and generate economic activity on the island. 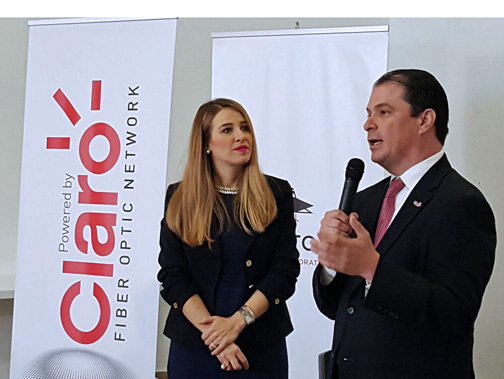 As part of the agreement, Claro donated to Piloto 151 a dedicated fiber optic infrastructure with a capacity for 100MB. In addition, the alliance will focus efforts on three pillars: training and mentoring; digital education, including the creation of a “Claro Hub” to contribute to technological infrastructure development; and research and development through “hackathons” focusing on spurring solutions via mobile apps. Hey Buddy!, I found this information for you: "Claro, Piloto 151 join to back start-up tech community". Here is the website link: https://newsismybusiness.com/piloto-start-community/. Thank you.